An eco-friendly lifestyle doesn’t have to be limited to the inside of your home. There’s now a plethora of solar gadgets you can incorporate into your front or back garden decor. With the amount of choice there is now on the market, these gadgets can range from the very obvious – i.e solar panels – to the much more subtle, in a way that disguises these nifty gadgets as aesthetically pleasing garden decor. So read on to discover how you can have achieve a stylish, yet self-sustainable garden with these fun solar gadgets. Thanks to innovations provided by solar energy companies, advanced solar tech gadgets have become more and more accessible. 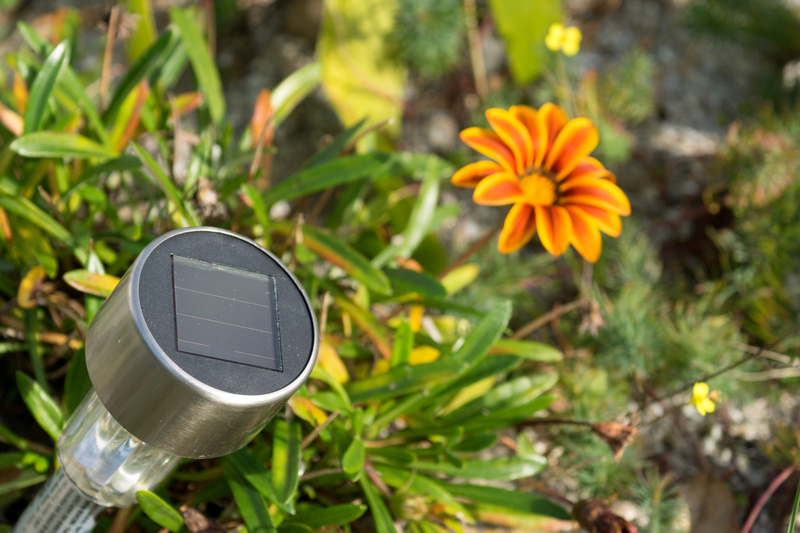 Now, as far as solar gadgets go, Tertill is as cute as they come. This solar-powered, weatherproof robot will weed your garden daily, pootling about on soil, sand, mulch, and grass. Not only is it a cool gadget to show off to your friends, but it’s super functional – a practical addition to your garden tools. When you’re too busy to pull weeds yourself, Tertill has got you covered. It also means that without having to worry about weeding, you can focus on other important gardening maintenance jobs. The solar panels make it self-sufficient and eco-friendly to boot. What’s not to love? SwiftlyDone offers a convenient, eco-friendly solution to your outdoor security needs. Their motion sensor outdoor LED security light is durable, heat and weather-proof. Its easy-installation feature means that it can very simply be peeled and stuck to any outdoor surface, no tools required. With it being solar powered, it doesn’t need any wiring up either – super convenient! The light automatically turns on at night, and off at sunrise, and brightens when it senses movement. This eco-friendly alternative to the classic outdoor security light is an absolute must in any garden. While a little on the kitsch side, this little solar owl light certainly has the cute factor. This light is perfect for anyone who loves wildlife and wants to inject a bit of feathered fun into their garden. You don’t have to worry about keeping your bike out in your yard anymore. The Ellipse solar bike lock will ensure they’re safe, whether they’re in proximity to your home out in public. You never know when you’ll need to take a late night venture into your yard or to your shed. Whether for an emergency or otherwise, a flashlight is an essential tool for your household arsenal. Never worry about having to replace or keep batteries on hand ever again, this flashlight is solar-powered and ready to go whenever you need it. Tired of mice, snakes and other outdoor pests ruining your vegetable or flower patch? These sonic expelling devices offer a humane solution to your problem. One of them targets moles, voles, and groundhogs specifically by emitting beeps of 400Hz every 30 seconds along with vibrations that will drive away even the most stubborn critters within 2-4 weeks. So these are just a few cool and useful solar gadgets you can add to your garden to impress your neighbors. Remember to keep checking back for more tips and advice on how to go green!